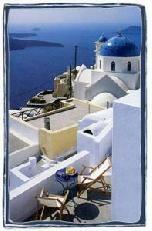 Holiday.gr - SANTORINI, a trip to a myth! 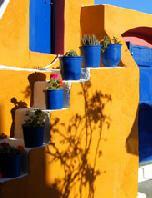 Been to SANTORINI ? Share your experiences! 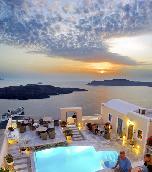 Santorini, island of sunset and lava. 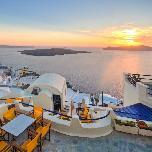 If somebody tried to make a choice among the top sightseeing of Greece he would certainly incude the island of Santorini. No matter how often one visits this place its magic and spectacle remain incomparable. 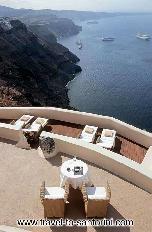 Santorini, or Thira is the southern most island of the Cyclades in Greece. It has a surface of 76 km a coastline length of 70 km and a population of 10,000 populations. 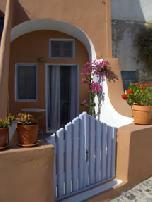 Santorini has 2 ports, the port of Athinios and the port of Gialos. 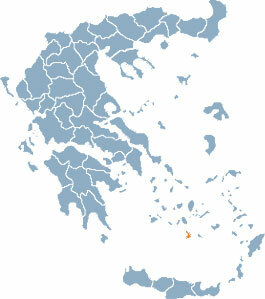 The port of Athinios is used by the line boats while the port of Gialos by the cruise boats and the yachts. To the port of Gialos (which is located at the town in Fira) one can go either by the cable car, or on donkey ride, even on foot, in case he likes photographing. Attention should be made however because the steps leading to the port are about 600. Fira: The islands capital, built at an elevation of 260 m above sea level, has got a strong cycladic character in the architecture and a cosmopolitan atmosphere. 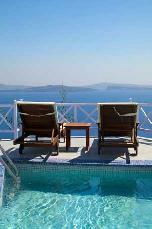 The view to the Caldera, Volcano and the Aegean Sea is spectacular. The Archaeological Museum, with an Archaic and Roman collection. The Venetian Guzi mansion, which houses concerts, exhibitions and other manifestation. The Cathedral of Ypapanti and the Cathollic Dominican nunney. The Bellonio Cultural Centre and the Nomikos Conference Centre. Akrotiri, with the Venetian Castle and the adjacent prehistoric City. In the archaeological site of Akrotiri the visitor sees the ruins of a whole city of the 17-century B.C brought to light by the recent excavations. 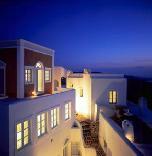 The picturesque Imerovigli, where the Venetian castle of Skaros, was the medieval capital of the island. 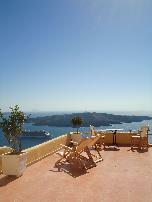 The view from here to the bay of the caldera is breathtaking. 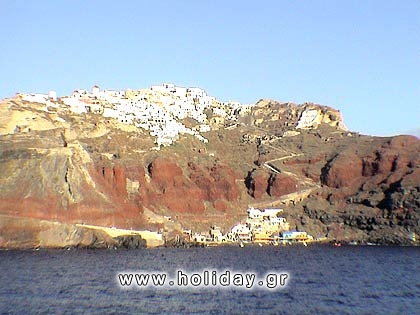 Oia: At the north tip of the island, Oia is more quiet than in Fira, very romantic and artistic, with captains’ mansions, windmills, marble paved narrow streets, nice cafés, restaurants and little shops. 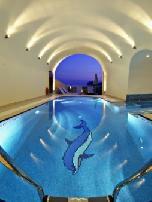 During sunset every body finds himself into the small castle in order to admire the colors of the diving sun. 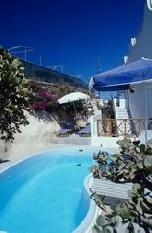 Bellow the village of Oia lies the small bay of Ammoudi with fresh fish restaurants. 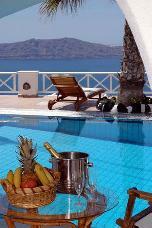 Firostephani: 700 m northern from Fira. 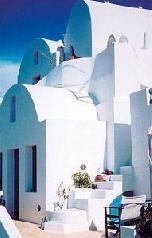 Is a small village of which stands the blue and white church of St. Gerasimos. 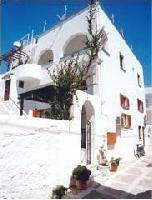 Megalochori Traditional settlement with strong cycladic character. Ancient Thira on Mesa Vouno. The Ancient Greek city of Thira extends a natural acropolis, on a mountaintop building from the 11th B.C includes mainly an agora, a theatre, temples and also a Byzantine chapel. 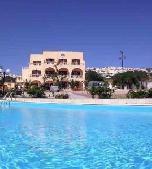 Messaria. A central village with many buildings of neoclassical style of architecture. 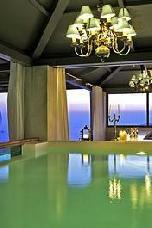 A very good example is the restored mansion of Argyros Family. 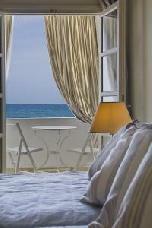 Pyrgos. Located at a height of 400 m crowned by the medieval castle (called Kastelli by the locals) and overlooking a big part of the island, Pyrgos makes one of the most elegant villages of the island. Important is the historical monastery of Prophet Elijah. Notably worth visiting is Pyrgos during Easter, when a spectacle of fires and scent on the night of the Epitaph remains an unforgettable experience. The numerous Churches of 16th and 17th centuries. 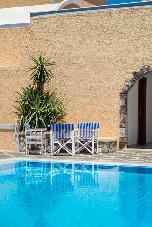 The volcanic islets of Palea and Nea Kammeni and the picturesque small island of Thirasia. For quality nice music, clubbing till the early morning hours and shopping there are many restaurants, clubs and shops in Fira. The islands capital. In Fira alone exist 180 jewellery shops! The numerous bars of Perissa and Kamari offer the opportunity for endless parties and hot nights, especially for young people. 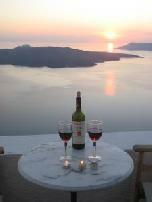 To buy the exclusives local wines (Vinsanto,Nichteri), fava , santorini tomatoes and capper. To watch the spectacular light and fireworks show in the second half of August, which imitates a volcanic eruption. To mention here that according to scientific researches the drowned island could be identified with the much discussed “ATLANTIS”. In the year between 1981 –83 the French explorer Jacque Cousteay anchored to Santorini and made surreys in the caldera wishing to be the First to discover the lost Atlantis. So, it is worth making a tour on the islets of Palea and Nea Kammeni or the underwater excursion to the bottom of the caldera. GET READY FOR THE EXPERIENCE OF A LIFE TIME. The Red beach. Its main characteristics are the red colour of the sand, the impressive red rocks and the emerald water. The White beach. This solitary beach with the white sand can only be reached by boat. Perissa, or the Black beach. The 7 km of this black sanded beach start from the spot of Perissa , continue with the beach of Perivolos and finally end to the beach of St.George. All way along there is sun-beds, umbrellas, beach bars with refreshing juices, cocktails and summer music. Monolithos Beach. 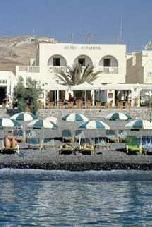 This is the closest beach to Fira rather unusual for Santorini, because of its shallow waters. The rocky beach of Ammoudi with the small fishermen harbor. The Coloumbo beach is close to an underwater crater and very suitable for nudism.